So, I finished my grocery shopping and went through the checkout. When I got home, I looked over my receipt--something I never used to do! But since I've been doing the budgeting and really working on saving money, I have checked over my receipts lately just to make sure I paid the prices I had planned on. 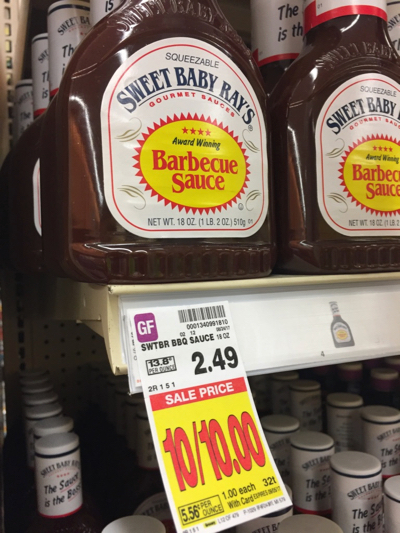 I noticed that the barbecue sauce rang up at $2.49 instead of the $1 that the sign had said. I used to be a cashier at Kroger, and I know that most of the time when a customer says that an item rang up at the wrong price, they actually just picked up the wrong item and assumed it was the one listed on the sign. For that reason, I always double check the UPC number on the shelf tag or ad sign with the item to make sure I'm getting the right thing. I was sure that I had picked up the correct bottle and that I didn't read the sign wrong. In the evening, I had to go back by Kroger when I took Noah to go skating with his friends, so I brought the barbecue sauce and my receipt to Kroger to hopefully get a refund of the difference. Noah and I went inside, and before I went to the customer service desk, I wanted to check the sign to make sure I wasn't wrong. We walked to the shelf and sure enough, there was a tag that read 10/$10. I didn't want the manager to have to walk all the way back there to check it out, so I took a picture of it with my phone to show her. We walked up to the service desk and I explained what happened. Today, the manager clearly didn't believe that I was telling the truth about the sign. I showed her the picture on my phone, and she said she was going to have to go check it out for herself. I waited patiently at the counter while she walked back there. When she came back, she said there wasn't a sign or tag anywhere saying that it was 10/$10. I was kind of stunned--it had literally only been about two minutes since I took the photo! Noah was with me, and he saw everything, too. I showed the manager the photo again, and she still didn't believe me--she told me that I was going to have to go back there and show the sign to her. At this point, I just wanted to prove I wasn't a liar, so I walked back there to show her the tag--and it was gone. I couldn't believe it! I'm SURE that she took the tag off of the shelf when she went to look for herself the first time. There is no way that one of the stock persons noticed it and removed it in the two minutes it took for me to walk to the front of the store! The time stamp on my photo even proved that it was there just minutes before. But she didn't want to look at that, and when I insisted that the tag was on the shelf just a couple of minutes ago, she just shrugged and said, "Well, there is no tag there, so I don't know what happened; they were on sale last week, but not now." I just stared, kind of stunned that she would even think that I was dumb enough to believe that the tag mysteriously disappeared or that one of the stock persons removed it. She then said, "Well, if you really think you saw a sign, then I'll just give it to you for that price; but I know they aren't on sale, so if there was a sign, it was a mistake." I know this is a long and petty story (it's just a bottle of barbecue sauce, after all) but I'm still just kind of speechless about the whole thing. Why didn't she just say, "Oh, that sign must have been left up there from last week; that's our mistake. But, since we didn't take the sign down, we'll just give it to you for that price" ? When I was a cashier, that's exactly how I would have handled it. Noah and I laughed about it when we left the store, wondering how in the heck that just happened. If nothing else, it made for a funny story to tell Jerry later. Anyone else have an odd customer service experience like this? It was definitely a first for me! You story caught me speachless! So dishonest treatment! Unfortunately I know that this could happen in my homecountry too, but I´m lucky that couldn´t happen in Switzerland, where I live now. Here is the customer service 100% better that in any other country. If I were in your shoes I´d raise a formal complain to that manager´s manager (or Kroger headquarters). Holy Cow!!! That's just nuts! What happened to "the customer is always right"? I don't live near a Kroger, but you can be certain I wouldn't be shopping there! Wow- that's awful. I would share that situation with someone outside the store or on their facebook page- posed as a question about what their policy is. Obviously that is a very poor manager. Katie! WTH! I 100% agree that you should take the time to report this to corporate- then write back and tell us if you e a response! I agree about getting the message to someone higher up at Kroger, and the reason for it is highlighted in the previous commenters statement that she won't shop at Kroger now, if given the opportunity. This exact thing happened to me once at a grocery store here. I think the issue was there's a policy here that if an item rings up wrong, they have to give the difference plus 10 times the difference, up to $10. It's a policy/law that was put in place by the county or state here to improve scanner accuracy back when stores wanted to stop individually marking each item with the price. So in my case, the store probably didn't want to fork over the extra money plus its probably a strike against them with the county. So maybe your area has the same law and she was trying to avoid having to give you extra money!! . I was at Babies"R"Us recently and there was a pack of bibs I wanted. Normally $14.99 they were 50% off. I made my purchase and left the store. I got to thinking about how much I paid and it seemed like a lot so I looked at my receipt. They hadn't discounted the bibs. So I went back in, found a manager, and of course she needed to go see the sign herself. She came to the front again saying she couldn't find a sign so I went back over there with her and thankfully it was still there. She said oh that was a sale last week but someone left the sign up by mistake. It's store policy though that she had to give me the discount. She wasn't too happy about it but she didn't seem upset at me. Just at the employee who left the sign up. You have a receipt clearly showing the item purchased and the price charged for it. THEN, you have 30 days to contact the store (either in person or in writing). If you have found an error and have your receipt, the store may refund you the difference in pricing plus a “bonus” of ten times the difference. The bonus must be at least $1.00, but may not be more than $5.00. I am speechless. What in the world?! Why lie and be so petty over a $2 bottle of BBQ sauce!? I just can't even. Kroger corperate definitely needs to hear this story! My husband and I often have conversations about how customer service certainly isn't what it used to be. Whatever happened to the customer always being right? Having grown up in the customer service industry, it can be disheartening to see how bad it's gotten. If these board and mortar stores don't want us to switch all of our shopping to the internet, they better start thinking about their customer service. That's for sure! You need to be proactive and contact her district manager with your transaction with this dishonest manager. Then you should contact corporate with your experience as well as with your photo. How many other customer have they treated like this? I would remind them that you are a customer who chooses to spend your money there and you can go somewhere else and advise them you have notified your family and friends. I would expect an apology and a gift card from this experience in front of my son. Looks like that was a sale from last week's flyer. They left the sign up, so the manager should have given them to you for a dollar each anyway. I would contact someone from the company for sure. This exact situation has happened to me at Kroger before!! Only I didn't have a picture on my phone to prove it. I'm sure whoever they sent to look for the sign removed it because I know it was there when I bought the item. That's so frustrating. I agree with the others, definitely call corporate or take it to Kroger's facebook page. There was no way they should have treated you like that. In California the law is they have to honor the posted price; whether it's expired or wrong doesn't matter. If you have a Twitter account, you could tweet at them. I have had good results tweeting at a company and getting them to respond in several instances. I used to only use it as a last resort bc I don't want to Twitter shame anyone, but sometimes it was the only way to get a response. So crummy what that manager did!! I'm not a fan of "the customer is always right" but in this case, you were and did not deserve the treatment you received! I used to work at Target and our policy was that if we left a sign up that was incorrect, we had to honor it. I agree this is just bad customer service. They act like the money is coming out of their own pocket! That is insane! I would have been so upset. I probably would have taken it above their just to prove my point. I would've called that girl out! What a fibber! What a bunch of crap! I am also a Michigander and am feeling really lucky that the Kroger near me have really amazing employees!! I am wondering if anyone that reads this blog works at Kroger and would have some advise for you??? I'll echo everyone else here. Share this blog post with Kroger corporate. I'm shocked that the managers treat you like this. I shop at two different Krogers (Canton/Plymouth) and the managers are SUPER FRIENDLY. By any chance is there another location you could easily shop at instead and see if the service is better? Oh man! I don't know if you're interested, but I would totally complain to their corporate office. That's a violation of their store policy (obviously) but I also think of families in poverty and elderly folks who might have been in that situation and her gas-lighting people like that could make them feel so humiliated, confused and even crazy! So not okay. Glad you're able to laugh it off! Oh My!!!!! That's awful! Here in NY I often shop at Wegman's. They have always gone above and beyond in customer service. I have gotten refunds on things that I couldn't bring back to the store! I bought oranges once and pretty much the whole bag was bad...REALLY bad by the next day. BUT I didn't get back to the store for another week. I mentioned it to the cashier and she told me to go to the service desk. I happened to have the previous visit receipt in my wallet and they gave me a refund AND another bag of oranges. WAY different service than what you received! I agree with others and think you may need to take this issue further up the chain! A few months ago, I went to Meijer later in the evening. When I went to get something from the Deli counter at 8:45pm, the person working back there said they were closed. I was sure that they were supposed to be open until 9p, so I talked to the manager at the customer service desk. He called back there and I could hear parts of his end of the conversation. I heard him say "I can check the camera to see the time she was back there." I'm sure the deli person told him I was there later than I was. Heck, my receipt from the whole trip was marked like 8:55pm. So the manager apologized to me and gave me a gift card for my trouble. I was so mad the person behind the deli tried to put it back on me though. To this day, whenever I shop at Meijer late, I see them turning the lights off early hoping they can deter customers! I worked at a bank for several years, and while it sucked to have someone pull up right at closing time, the right thing to do is help them with a smile on your face! We even had a policy that we had to keep the lights on for 5 minutes past the time we were supposed to close. I agree with other posters, customer service isn't what it used to be! Look for the promotions online or in the flyer. Report them to the BBB immediately. Were you able to see a date on the tag for the sales dates or even find a circular for the store that had the sale price to prove her wrong? Either way she could of been a bit more polite about it. I don't know what she would of gotten out of it by doing this. When I uploaded the photo, I zoomed in close enough to see that the sale had ended a couple of days prior (I didn't notice this in the store). If the service manager had just pointed that out to me, I would have been completely understanding. There was no reason for her to lie about it--it was so odd! Wow, that is pretty bad!! She caused herself a lot more work than she needed to, not to mention being dishonest on top of it. It is a shame that some people would choose to go that route! I, too, would have been completely understanding if told that the sale had ended. And most places would probably give you the discount since it was their bad to leave the sign up. Thanks for sharing that. I bet you were pretty dumbfounded! And I am glad to hear that Kroger has done a couple things to make it right. That goes a long way.